English Chat Hour: Sweets Edition! There are a few things in life that I am particularly passionate about, and one of those is food. While I appreciate any kind of well made food, I particularly love sweets. Cakes, ice cream, cookies, candy, cupcakes, puddings… You name a sweet, chances are I’ve probably eaten and/or made it–and if not, sign me up to try it. Honestly, it wouldn’t be too big of a leap to say that when I get a hold of a particularly delicious daifuku my face looks a lot like the Sweet Tooth Salaryman Kantaro’s (さぼリーマン甘太朗) when he indulges in a delicious dessert. Of course, one of the best parts of being a sweets enthusiast is sharing all those tasty treats with other people! 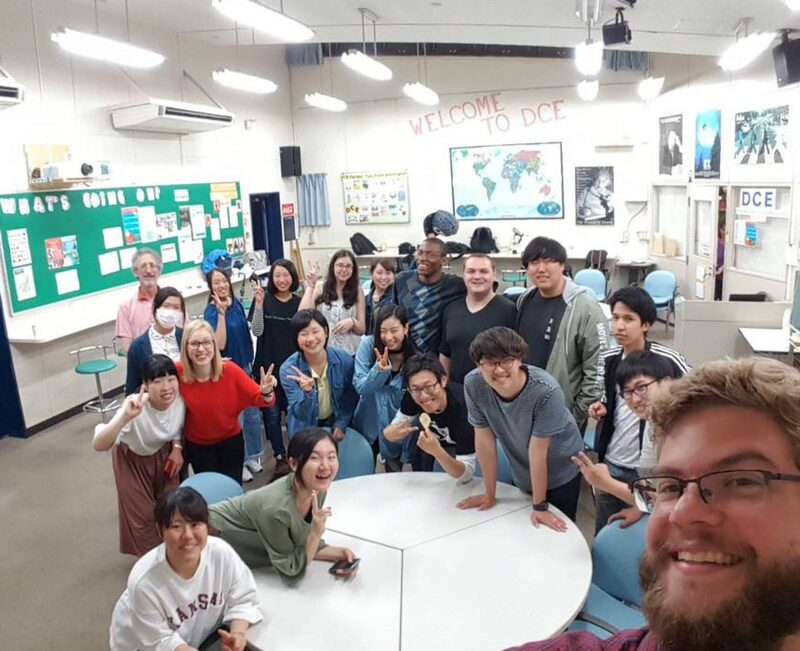 I particularly wanted to share some of my favorite sweets from America with the students at IC, so I asked students at Chat Hour if they would be interested in learning to make something. The five girls at my table were incredibly enthusiastic about the idea, so I reserved the small kitchen on the second floor of the cafeteria building for last Friday during 2nd hour. 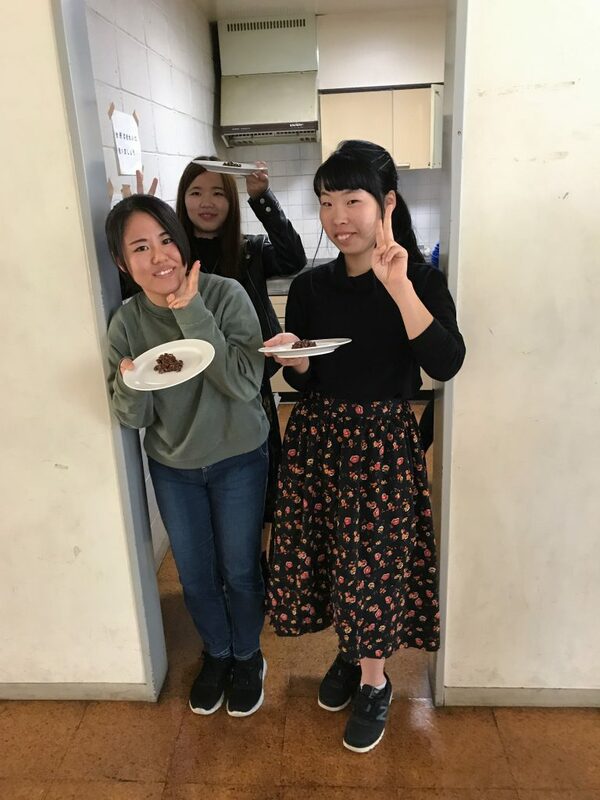 The students were kind enough to agree to each pay a ¥300 (about $2.50) fee to help pay for supplies for one of my personal favorite, go to recipes: chocolate peanut butter no-bake cookies. 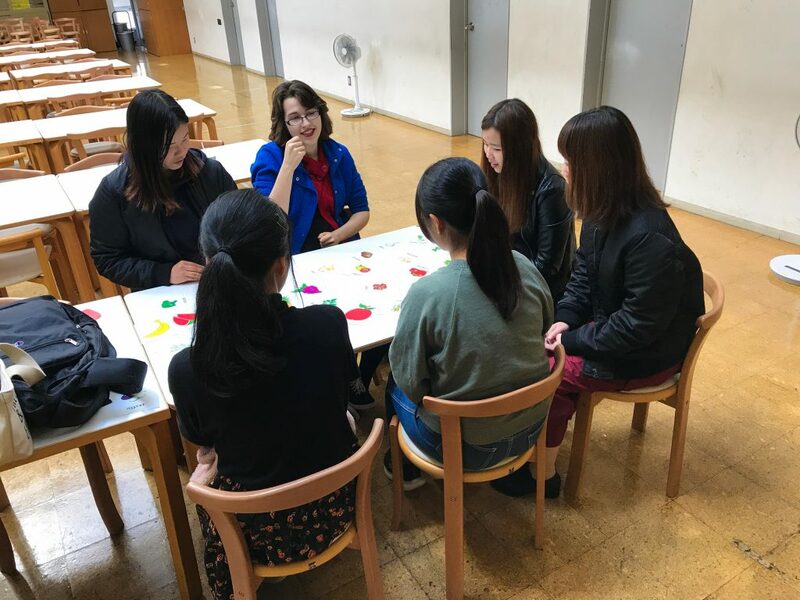 The recipe is fairly simple, and difficult to ruin, so it was perfect for my first foray into teaching students to cook something in English. On Friday, the five girls and I met up in the normal Chat Hour room, 5100, and then headed over to the cafeteria building together. I had picked up the ingredients earlier that week, so we were set to cook when we got there. Or, well, we thought we were. Then, after getting halfway through the recipe, we realized none of us had any idea how to work the stove in the kitchen. Accurate portrayal of us trying to figure out how the stove worked. Fortunately the girls were quite persistent, and we eventually figured out that the stove required a certain kind of pan to be used with it, or else it wouldn’t start heating up. Once we had that settled, we were off! …until I realized I forgot my measuring spoons at home. But, as no-bakes are difficult to completely mess up, we pushed forward and I taught the students the word “eyeball”, as in “I’m going to eyeball the amount of cocoa powder we need” (also known as “I’m going to haphazardly throw a couple spoons of cocoa powder in and hope this still turns out edible”). Thankfully, we made it through the rest of the recipe without any more mishaps and put the no-bakes in the fridge to set with plenty of time to spare. They look ugly, but they taste amazing, I swear! While we waited for the no-bakes to set, we played a Karuta inspired game in English with food themed cards. Each card had the picture of a fruit or vegetable on it. The leader of the game would choose one of the cards without saying the name of the fruit or vegetable, and begin describing that fruit or vegetable. For example, if the leader was thinking of a watermelon, they might say something like, “This fruit is large and round, and is popular in Japan during the summer.” The first player to guess the fruit or vegetable correctly and grab the correct card got to keep the card. At the end of the game, each player counted up the number of cards they collected, and the player with the most cards won. Twenty minutes of gameplay later, the cookies were set and ready to eat! We retrieved the cookies from the fridge, plated them, and dug in. I am happy to note that the students liked them enough to go back for seconds! Despite a few bumps along the way, I’d consider this dessert themed Chat Hour one sweet success. Next time I’m thinking…apple crisp? Stay tuned for the hopeful Chat Hour: Sweets Edition #2 to see how it goes. If you’d like to try making no-bakes yourself, you can find the recipe we used on Food Network’s site by clicking this link.